Human Values: The Tagorean Panorama (with Dr. S.K. Chakraborty). New Age International, New Delhi. 1996. The first English translation from Bengali. Managing Values: “a welcome addition to the growing literature of the ethico-moral art of management…practical yet profound values for daily life…The authors, indeed, deserve praise for making this treasure-trove available to the English-speaking audience…these inspired talks will be an excellent handbook for experienced and senior managers who have lived through stress and strains, trials and tribulations. In the days of ruthless hedonism which caters for cakes and ale, the intensely spiritual yet immensely practical instructions of Tagore will, no doubt, bring about attitudinal change from Individualism to Universalism, from suspicion to trust, from hatred to love, from chaos to cosmos… Such insights which combine spirituality with materialism are a rarity and these will, certainly, turn our mind from the daily monotonous rut of thinking to something new, something fresh for revising our old established ideas procedures, providing an aid to holistic management.” Pankaj Kumar Mandal, The Statesman. Small is beautiful: “they are excellent specimens of creative treatments in which philosophy, poetry and pragmatism have a memorable rendezvous.” Prof. Manoj Das, The Hindu. No, this is not just a book: verily it is an invitation for kindling consciousness itself… One feels beholden to Chakraborty and Bhattacharya for the cumulus of wisdom they have painstakingly arranged and offered with care and sensitivity in this collection of essays on human reality by one of the greatest sages of our times… Do we really need a Jonathan Livingstone Seagull to bring this home to us from across the Atlantic? … the oarsmen, Chakraborty and Bhattacharya, steer the boat over a smooth course into eternity. Nowhere is there an undue splash of oars to register a presence, not even in their brief introduction where one gets the impression that the effort is not to say much themselves but to induce the reader to step into the main text… Nor do the translators’ personalities intrude upon the reader, consistently revealing the subtle mastery, the unstated competence of the nature percussionist, constantly drawing one’s attention to the singer with well rounded echoes, enough to uphold but never to obtrude. This book is indeed a work of love, untainted by the gravitational pulls of small individual egos; hence the sense of unity and harmony.” Shashi Mishra IAS, Director General YASHADA, Journal of Human Values. 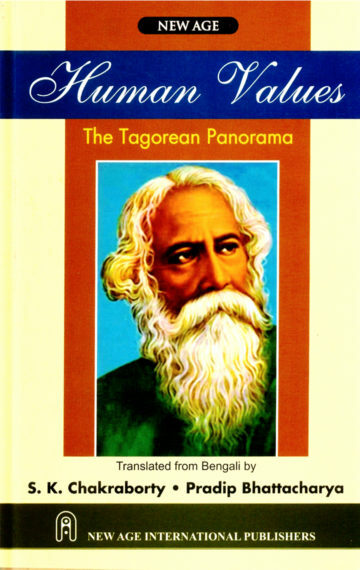 “Chakraborty and Bhattacharya have rendered yeomen’s service to the English readership by providing English translations of discourses and essays from Tagore’s Santiniketan…What strikes one at the outset is the simple elegance of honest translation… The translation touches you as does the original…very sensitively captured and conveyed in these translations. They have like expert oarsmen steered our understanding through Tagore’s wisdom. The qualities of honesty, sensitivity and the easy graceful flow of language place this book in the must-read class. Going through the essays has been an educative and cherished experience…it will indeed be a very important weapon in the quiver of managers and administrators.” Maj.Gen. S.K.Sen, VSM in The Statesman.